For the first time in history the President of the United States will participate in the March for Life in Washington, DC via satellite link. He address the March for Life live from the White House Rose Garden. This annual pro-life march remembers the Supreme Court’s 1973 decision in Roe v Wade that legalised abortion. This year's theme is “Love Saves Lives”. 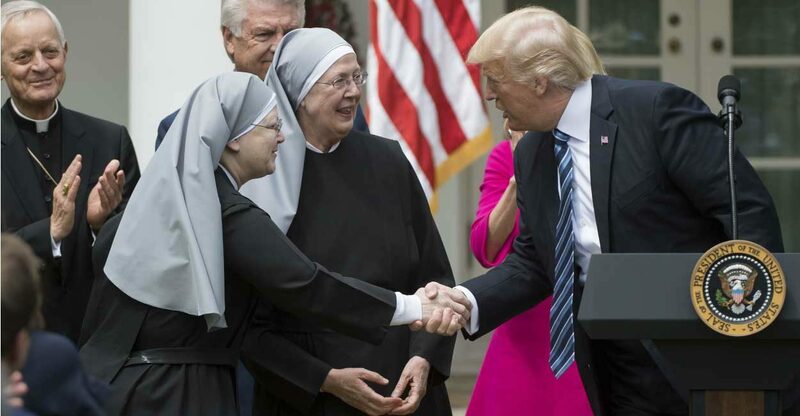 Jeanne Mancini, president of March for Life, said, “Since his first day in office, President Trump has remained steadfast on his campaign promises to the pro-life cause and has actively worked to protect the unborn. … We welcome our 45th president, Donald Trump, to the 45th annual March for Life.” “Over the past year, the Trump administration has significantly advanced pro-life policy, and it is with great confidence that, under his leadership, we expect to see other pro-life achievements in the years to come,” she said. Vice President Mike Pence addressed the March for Life from the speakers’ stage last year. Catholics attending the March will receive a Plenary indulgence. President Ronald Reagan, President George H.W. Bush and President George W. Bush all addressed the march via telephone or a radio hookup from the Oval Office. Another prominent Catholic will address the crowd this year; House Speaker Paul Ryan. Two other Catholic congressmen will join; Democrat Dan Lipinksi and Republican Chris Smith.This year’s event begins with a rally on the National Mall between Madison Drive and Jefferson Drive. After the speakers addresses the participants will march down Constitution Avenue toward the US Capitol and then to the area outside the US Supreme Court. Famous speakers include Pam Tebow, mother of former football player Tim Tebow. Her doctors told her she had to have an abortion to save her own life, but she refused and delivered a healthy boy. Great post about Donald Trump. Trump News are now a days become a highlight of many newspapers, articles as well as on the internet. Thanks for sharing this post.